Got it from: Freemont Used Books for a whole 25 cents! Alas, my plowing through the novel was curtailed by a long and violent fever, which was not as all as romantic as those swoonings in novels set in yesteryear. They mostly consisted of my hauling my carcass to work for various shifts, followed by sudden collapses on the sofa and wailings to my husband to keep the popcorn chicken coming. A quiet convalescent I am not. Happily, I finished this novel before last night's earache set in, the likes of which have not been seen since my junior high days. It brought to mind a certain class visit to a generating station in ninth grade, in which my ear hurt so much, I nearly passed out in that room with all the flashing buttons and knobs. (The knobs were mostly my other classmates. But I digress). 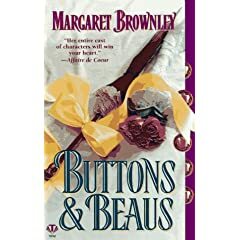 Okay, this novel wasn't nearly as bad as I expected, even though it's about bicycling and the cover copy hints that the main characters are "on a bumpy ride to love," they experience an "overwhelming desire neither can put the brakes on," and expresses the hope they will "ride in tandem on the byways of love." How could I resist a book with such groan-worthy puns? And for something that had to entertain me for nine hours on a train, it could have been worse. I actually found myself laughing out loud at a several points. Believe me, a book with both a "special needs" and a crippled child had better be darn funny to compensate. Happily, I really liked the two protagonists and the book wasn't all that stupid. I'd write more, but my ears are wringing and History Bites is calling, so I must go. B. *Ed note - Although, remember, I'm the woman who thinks Uncle John Bathroom Readers are compelling stuff.